India's connection with the West has in the past predominantly been related to trade. Spices, textiles and other Oriental products were much sought after. In the seventeenth century the expeditions of the Portuguese, Dutch, English and French trading companies to the Far East and India caused a tremendous interest in Oriental artefacts in addition to the spices, silks, tea and other items which were being traded. The Portuguese were the first to establish themselves in India. They arrived as early as 1498 via Cape of Good Hope, discovered by Vasco da Gama and had their first settlement in India in Cochin at the South Western coast. The Portuguese were soon followed by European rivals like the Dutch, British and French. 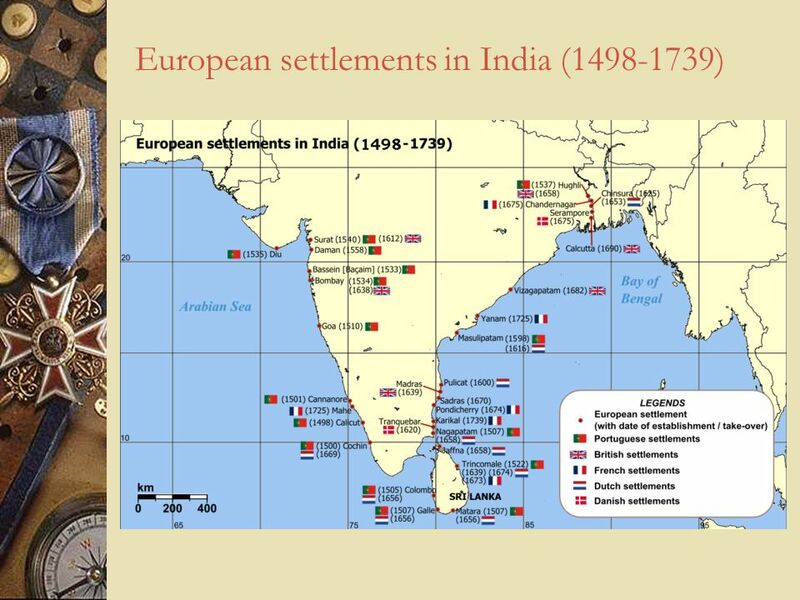 The Dutch had their first settlement in Pulicat at the South Eastern Coast, the British in Surat (Gujarat), the French in Pondicherry. 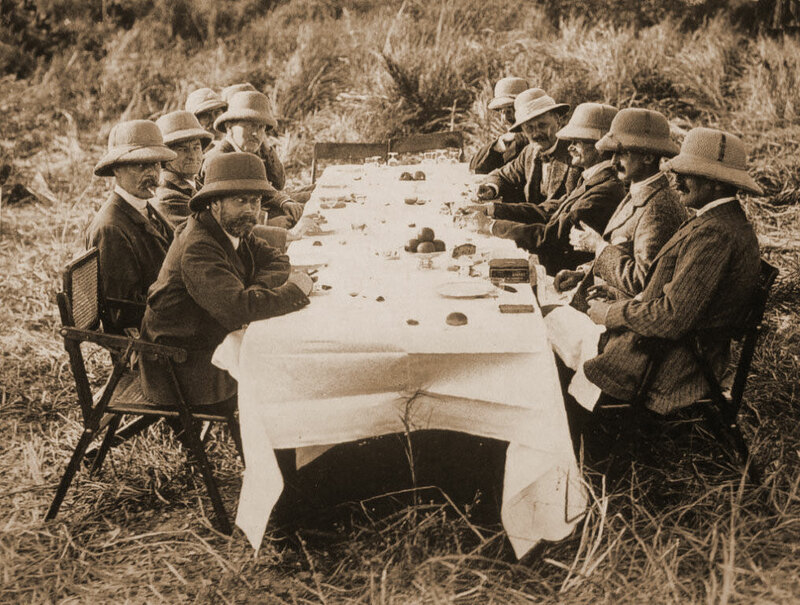 Prior to the arrival of the Europeans to the Indian subcontinent, people traditionally sat, ate and socialized at ground level on portable textiles. However the presence of Europeans from the sixteenth century onwards introduced a demand for the elevated type of furniture from the West. The Portuguese found that there was no local infrastructure for the production of the furniture they were used to. They, and later also the Dutch, British and French, filled this need by commissioning Western style furniture from native carpenters. The European traders began by exporting Western prototypes to copy and it was soon discovered that the Indian craftsmen were highly skilled. This skill coupled with an incredible imagination led to the emergence of the independent Indo-European style. The styles of Indo-European furniture can be split into three groups, according to whether the influence was primarily Portuguese, Dutch or British. Campaign furniture can be considered a separate, fourth group but is primarily British in style. The Indo-Portuguese group consists of two styles: the Northern Indian or Mughal and the Southern or so called Goanese. 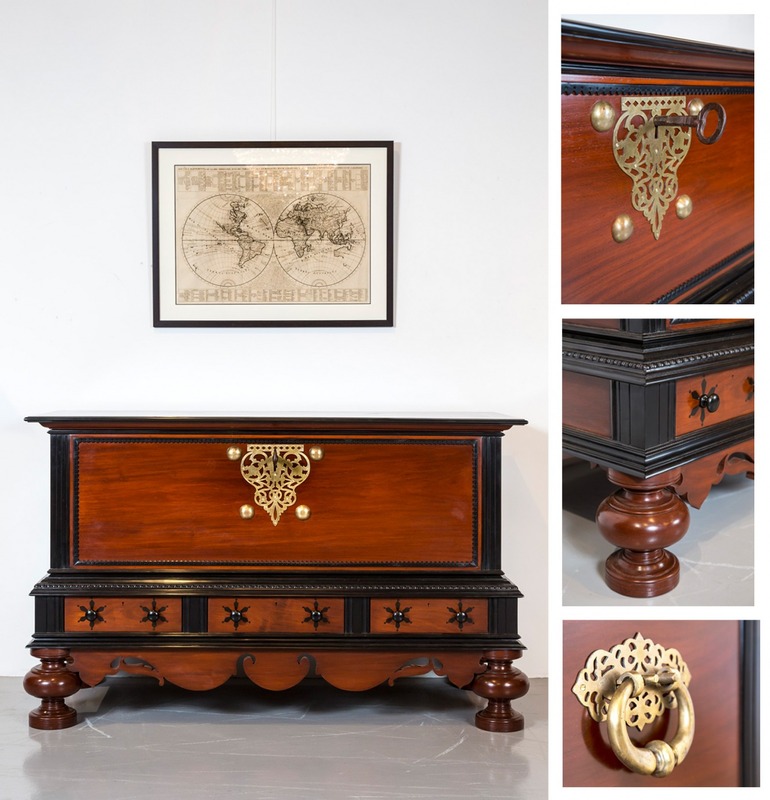 The first is artistically presumed to be the more interesting and includes a variety of furniture decorated with inlaid bone, ivory on ebony and other dark woods. Interestingly enough tables and writing cabinets in the Italian Renaissance form are found in this category because this was the dominant style in Portugal at that time. The Goanese style, which got its name after the state at the Malabar Coast in South West India, is more stereotyped in form and decoration. It is distinguished by small and elegant pieces richly carved with romantic flowery designs often centered with a holy cross which relates to the Christian influence of the Portuguese. However you will also find large and rather cumbersome cabinets of a type known in Portugal as contador, the inlay ornament being either geometrical or semi-abstract. Many of the Goanese pieces are made of rosewood. The Indo-Dutch style is usually characterized by the combined use of light and dark colored wood to create a contrasting effect. There is furniture made of mahogany or satinwood which is inlaid with ebony. This style originates primarily from the Coromandel Coast. There is also furniture whereby the ebony is carved and mounted on the surface of the light colored wood. This relief decoration is floral in character and is often inspired by the Dutch tulip. 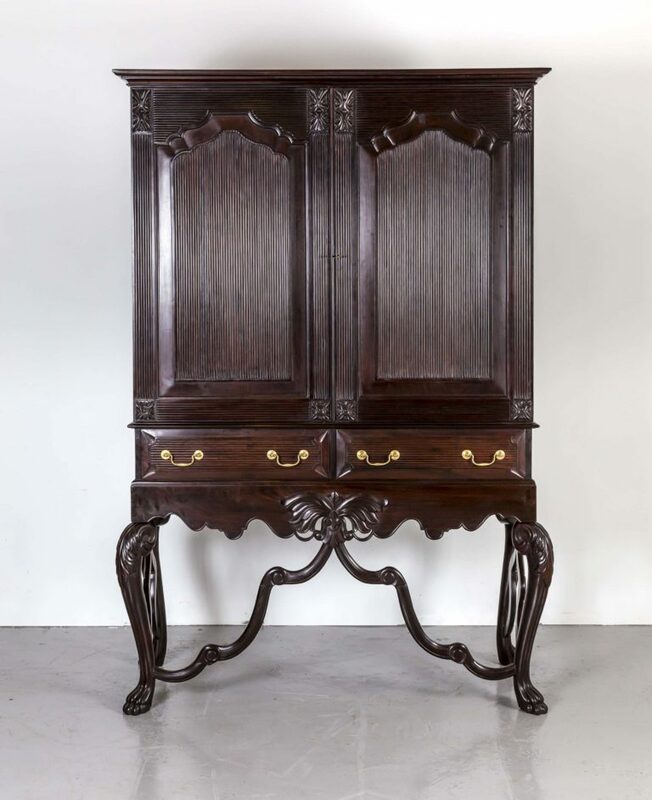 In particular the legs of Dutch colonial chests and cupboards are typical by their form which is bulbous at the top followed by a ring ending in a tapering peg foot. With the growth of British power in India in the 18th century, all Indo-European furniture styles came increasingly under English influence. This led to a widespread demand for furnishings in the typical British late Georgian, Regency and Victorian styles. Whole suites were made in the manner of the famous cabinet makers Chippendale and Sheraton, not only for European buyers but also for Indian rulers who increasingly favored European style furniture. In the 19th century, Indian cabinetmakers still grounded their work in the European tradition but added distinctly Indian touches. The emphasis was on decorative elaboration and much of the 19th-century Indian wood carving shows great technical skill. 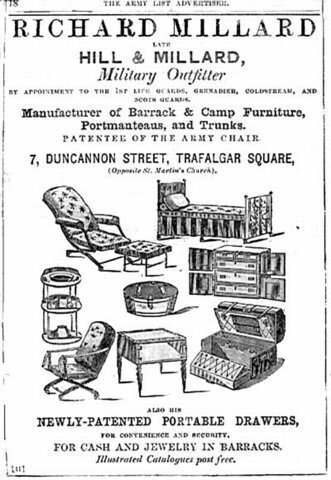 Campaign furniture, also known as knockdown furniture, is relatively rare. It is basically any furniture made specifically for travel, being designed in such a way that it could be carried with ease, with either heavy (brass) handles or disassembled completely to be packed away for long expeditions. In the 19th century, Indian cabinetmakers still grounded their work in the European tradition but added distinctly Indian touches. 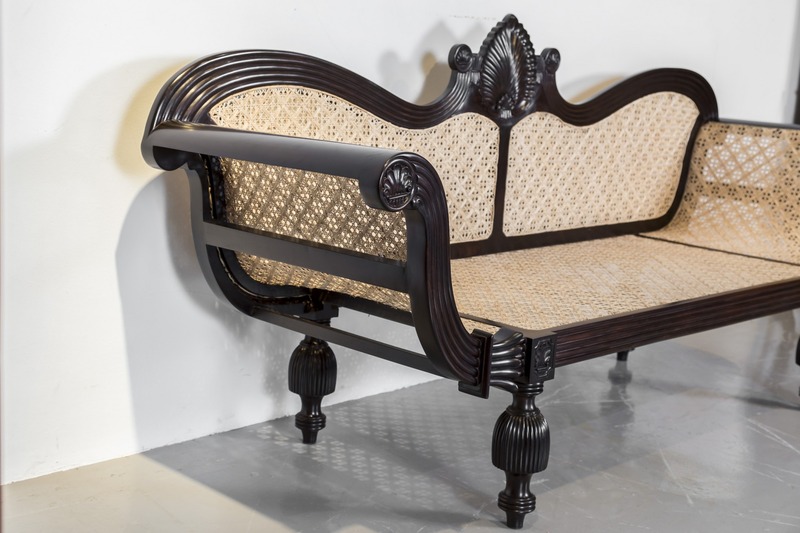 The emphasis was on decorative elaboration and much of the 19th-century Indian wood carving shows great technical skill.It was the British during the eighteenth and nineteenth century who took it to a new level of luxury and ingenuity. 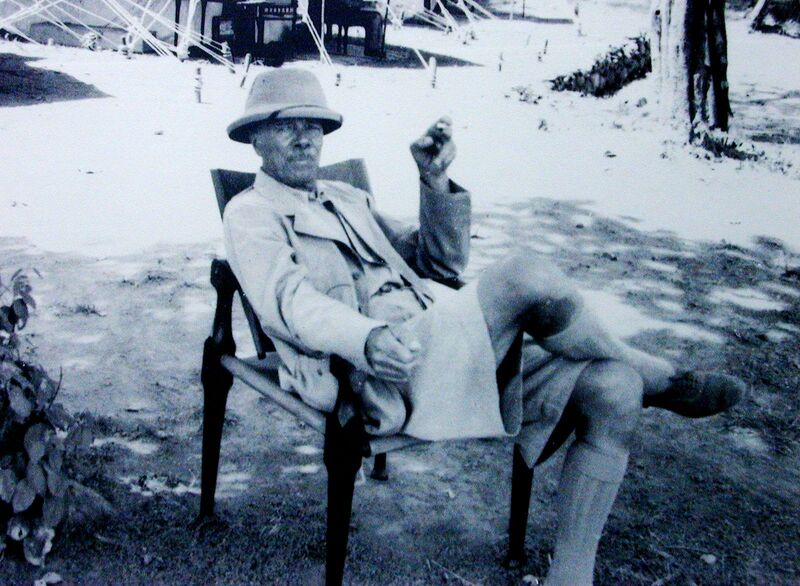 A gentleman required a certain level of comfort, so the furniture to which he was accustomed back home would need to be reproduced while he was camping in a tent in the desert or furnishing his new house in Bombay.